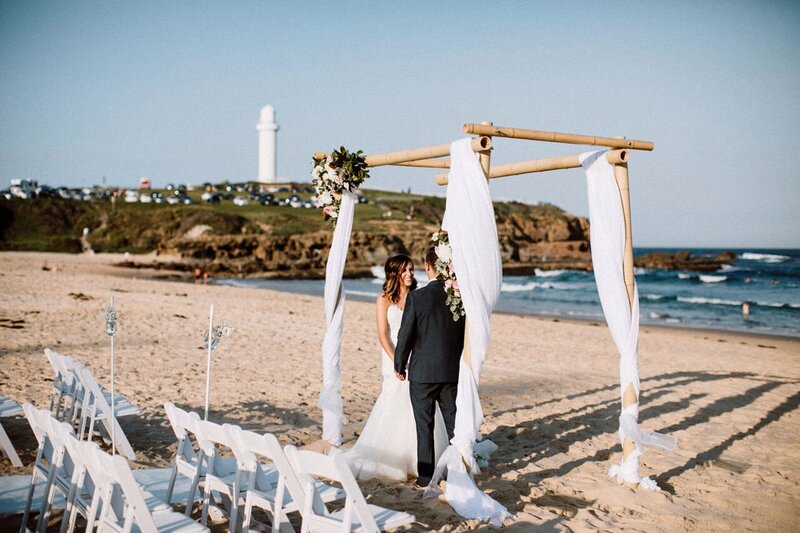 Have your fairy tale wedding and say "I do" in front of the stunning backdrop & ocean views of Flagstaff Hill and Wollongong’s iconic lighthouse, or bury your toes in the sand at Wollongong City Beach. Directly in front of our beautiful beachfront reception venue. We would like to thank all the staff involved in both the planning of our wedding and working on the day. Melissa was phenomenal with our planning and nothing was a big ask. She is very easy to get along with, has great communication and response time that I did not stress AT ALL planning our wedding. Both the FOH and BOH staff were amazing on the night. The food was a huge hit with many guests complimenting the taste of the meals and the presentation. The grazing table was also a huge hit, with the best we have ever seen. CBFC package inclusions made everything so easy as well. From the inclusion of a ceremony package at the lighthouse, the amazing cake made by Delaney's cakes to the MC and DJ who were both awesome and easy going. Everyone involved in our day just had a great professional vibe and were so helpful, especially with our newborn present. We really could not fault the reception at all! Set right on the beach it was a beautiful location and ran smoothly I wish we could re live it all over again at CBFC. Thank you so so much to everyone involved. We honestly could not fault the venue and service that we received. From the initial meeting to exiting the venue on our wedding day the City Beach team went above and beyond to ensure that our day went exactly to plan. I could not recommend the venue and team enough! Melissa from the very start made sure our day was just what we wanted. The staff were very flexible and easy going and made sure that we hardly had to think about a thing. Our guests were very complimentary about the food, especially the grazing table and the long beverage list. On the day Therese and her team looked after us as well as our guests and she even assisted with a last minute dietary requirement which we truly appreciated. This venue is a great place to have a wedding because it was fuss-free for us due to their careful planning and organisation, it included a comprehensive package that could be changed to suit our needs and the location is truly stunning. Thank you to the entire CityBeach team for making our day exactly how we wanted it! We could not fault a thing, the day was perfect. The staff were so helpful and friendly. Food was absolutely divine and presentation was fantastic! A Huge thank you to Melissa and Therese who went above and beyond to ensure everything was perfect for our day. From the beginning to the end Mel & Therese were incredibly friendly and turned a process that can be often stressful into something fun and enjoyable! Our day was absolutely amazing & there is truly not a thing I can fault about our reception. The service by the staff, the venue & food exceeded all our expectations & you all created a night that we will never forget! Thank you!! Thank you so much city beach function centre for all of your assistance in organising our wedding! The night was magical and wouldn’t have been the same without your assistance. Our wedding was beautiful and was loved by all! Especially the food! Thank you again so much in making our dream wedding become reality! We had the most amazing experience with Citybeach right from the very beginning. Melissa is so helpful and was so quick to respond to all my emails/calls, which made us feel so relaxed knowing that everything was taken care of. We couldn't have asked for a better night. The staff were so amazing on the night as well. They checked in on us throughout the night and made sure we were well looked after. The inclusion of the MC and DJ were fantastic; Dave (Collins) is very charismatic and Chris played all our favourite requests. We had such a great time celebrating with our family and friends and will definitely be recommending Citybeach to everyone. A big thank you to Melissa and the team for organising our wedding reception. Everything was perfect, we couldn't have asked for anything more. The room set up was absolutely beautiful, the food was delicious and the staff friendly and helpful all night long! Everything was absolutely 10/10! I couldn’t have been more pleased with everything from our initial enquiry, all the way up until after our wedding day! Can't fault the team at City Beach. Everything was perfect. We are so glad we chose City Beach as our reception venue. The staff and service was second to none and we had a lot of comments from our guests saying how great the service was thru out the night. The food tasted and was presented to perfection. Cohen and I highly recommend you guys to any future brides and grooms. thank you for all of your help on the night and also the months leading up to our wedding! Everything Was Fantastic! Everyone commented on how amazing the food was, service & location! It was everything + more then what I expected it would be, most memorable and funniest night of our lives. Thank you so much! Melissa & Therese were absolutely incredible on the lead up, the day of and after our wedding. They were beyond helpful & super attentive to even the minor details of our wedding set up. I cannot fault them or the venue and we would highly recommend City Beach for anyone thinking of getting married or holding an event. We cannot thank all of the CityBeach staff enough for how amazing they made our wedding! Melissa organised everything so beautifully for us, and we felt like we did not have to worry about anything. The service and food was perfection, and all our friends and family have told us how much they enjoyed the night. For anyone thinking of having their wedding here, you have to choose CityBeach if you want great organisation and service! We had the best time. City Beach made things very easy throughout the entire progress. It was great they let us set up the day before. All staff we dealt with were so helpful and friendly. We have had so many positive comments about our reception from how great the food was to how beautiful the venue is. Would definitely recommend. Just want to say thank you for all the hard work you have put on for our wedding day! It was definitely the best day of our lives! From the reception, the waiters etc! Everyone loved the food and the drinks. The staff were absolutely fantastic, nothing was an issue for them. Melissa & Therese we’re especially great. This is the best location in Wollongong and the staff helpful and accommodating. If you don’t use this function centre for your special day, then you have not booked the right venue. From start to finish nothing was too much trouble or a problem! Had complete trust that our day would be great and even when the weather wasn’t the team made it magical. Also all of our guests have been commenting on how great the food and service was on the night!! A BIG thank you to Melissa, Amy, Josie and the Team for their excellent service during the planning and of course our special day. You guys really made it awesome! We wish we could give 10 stars!!! My husband and I are still smiling from ear to ear. We had a fantastic wedding day & night. So friendly, professional, experienced right from the beginning which carried through right up until midnight on our wedding night. The whole City Beach Team is wonderful. Compliments from us & our guests on the delicious food too! Our guests complimented the wait staff as they were really friendly and constantly walking around asking if anyone would like food. Melissa was very helpful during the whole experience and made it very easy. Thank you so much for making it seamless and fun. I just wanted to say a massive thank you for everything you did for our wedding day. They day went perfectly and we are so happy with everyone and everything at city beach. We couldn’t have asked for a better place to have our reception. Everyone from my wedding were also very pleased with the venue. Thank you so much for putting everything together for us! The food was amazing and all the staff were lovely. Our guests were saying how impressed they were with everything City Beach offered!